Anyways, on with todays post. It's another oldie (but a goodie), and like a lot of the books that'll pass the revue on Thursdays, it's part of Boxall's 1001 Books You Need to Read Before You Die. (Like so many other fools, I'm tackling the list). And it's part of the Guardian's 1000 Books You Need To Read (which can be found here). Yes, one monstrous list is not enough for me, oh no siree. And if you combine the different edition's of Boxall's with the Guardiands list, there's about 1850 books on there.... 10 years should be enough to get through it, right? (well, okay, more like 20, or at my current rate: 250. Years). 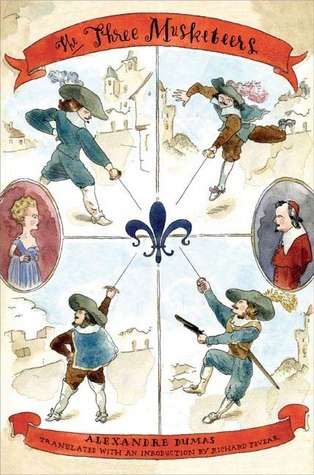 A long, winding intro, just to tell you that today's book is 'The Three Musketeers' by Alexandre Dumas. The first part is quite humorous, laugh-out-loud funny at times, but then the narrative starts to drag, and towards the end it spirals into a dark tale. I'm not sure I like the progression of the 4 musketeers's characters, towards the end they turn into rather unpleasant people. The other female characters are just there to sit around, be pretty and be the motive behind the heroes' actions (and I use the term 'hero' loosely, because some of the actions of the musketeers are anything but heroic). The only few chapters that attempt to bring a bit of depth to Milady are those where whe's imprisoned by Lord de Winter, and she schemes and manipulates to facilitate her escape. All in all, after like the first third of the book, I became rather disenchanted by it. With all the repetitions and unnecessary elaborations, the book could easily have been about 200 pages shorter and the story not suffer from it. The one that made a rather big impression on me as a kid, are the 1970s movies with Michael York. (And Charleton Heston. And Richard Chamberlain. And Faye Duaway. )Not because the movies are good (although they're definately not bad either), but the way the musketeers dart accross the screen, the colourful costumes... it all just made a lasting impression. One of my all-time favourites is the 1993 movie, with Tim Curry, Oliver Platt and, oh yeah, Kiefer Sutherland, Charlie Sheen and Chris O'Donnell. It's not one of my favourites because it's so good, but it holds a lot of memories for me, and I suppose we're all partial to things that where popular in our teen years. Even if you didn't like it then, once you get a couple of years older, you look back on it all with a sort of fondness. And I know I must sound totally biased, or have two standards (and apparantly, I do...), because sometimes I'll bash a movie for not being true to the book (and we're not talking details here), and sometimes I'll praise it for not being true to the original. But on this one, it just worked. 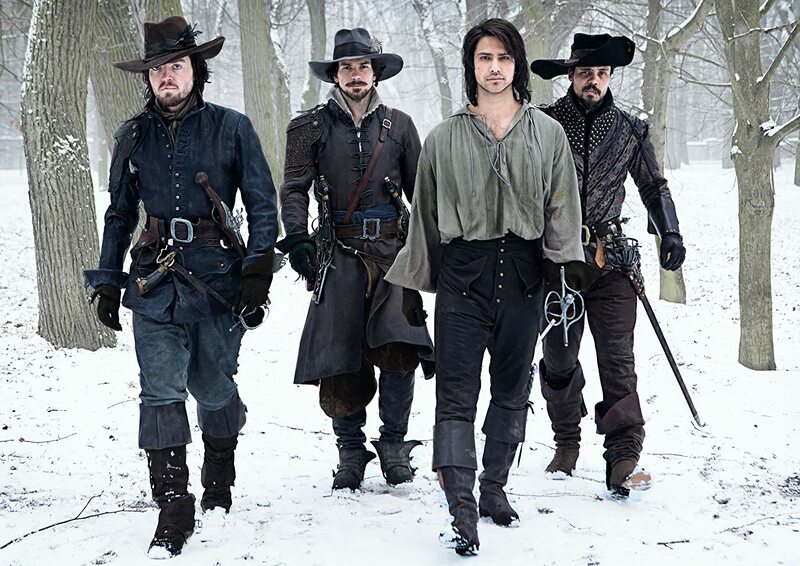 There is also a brilliant, recent BBC series called The Musketeers (3 seasons). I highly reccomend it. The story has little similarity to the book, but boy oh boy, it is GOOD. Adventure, excitement, and real heroes. Even when they make questionable choices, these characters have a higher moral code than anyone in the original book. They turned Milady in a cunning, smart woman. And Constance is a strong woman, who's torn between her duty and her heart.... As for the male characters, well, they're all perfect in their own way. And the casting is the most perfect one I've seen in a long time. And the costumes! I could go on and on about how perfect this series is, really. Last movie I want to mention is this one: The Ring of the Muskteers. It's a made-for-tv movie starring Thomas Gottschalk (a very, very popular German actor/presenter during the 1980-90s-2000s), Cheech Marin and David Hasselhoff. Just those 3 names should give yo an idea of how ridiculous this movie is, but it is a barrell of laughs. In short, the decendants of the original 4 musketeers (who all wear their ancestor's ring), try to protect the innocent and make the world a better place.